In stock -This product will ship today if ordered within the next 10 hours and 53 minutes. Natural Health Practice - Immune Nutrition Support is formulated especially for a healthy immune system. It contains a remarkable combination of key nutrients in one supplement for healthy immune function including vitamins, minerals and botanicals. This unique botanical formulation is for those people who want to maintain a healthy immune function and is a special combination of carefully chosen botanicals and nutrients. Immune Nutrition Support contains a useful combination for promoting good immune function. It provides good amounts of black elderberry, olive leaf, zinc, beta 1,3, glucans, vitamin D3, mushrooms, vitamin C and probiotics. Vitamins C, D3 and zinc contribute to the normal function of your immune system. All in just two capsules a day to help support healthy immune function. No excipients (such as fillers, anti-caking agents, preservatives) in the capsules just the key nutrients you need. Immune Nutrition Support is free from gluten, yeast and dairy products. It is made without the use of artificial flavours, colours or preservatives, it is Kosher and approved by the Vegetarian Society. Black Elderberry Powder, Olive Leaf, Mushroom Blend (Reishi, Shitake, Maitake), Vitamin C (As Calcium Ascorbate), Beta 1,3 glucans, Bifido Blend, Breve, Longum and Infantis, Lactobacillus Acidophilus, Zinc (As Citrate), Vitamin D3 (as Cholecalciferol), Capsule Shell: Hydroxypropyl Methylcellulose. For best results take 1-2 capsules daily with food. Below are reviews of Natural Health Practice Immune Support - 60 Vegicaps by bodykind customers. If you have tried this product we'd love to hear what you think so please leave a review. 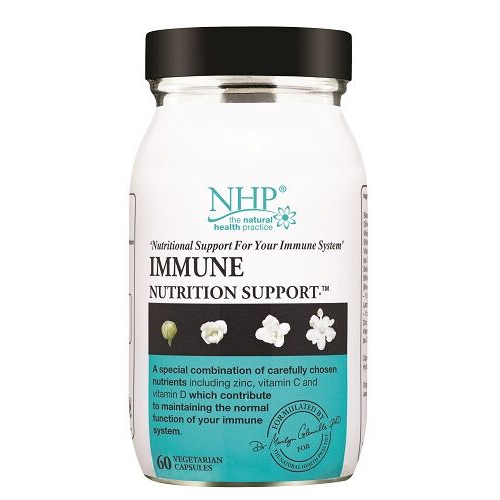 Natural Health Practice - Immune Nutrition Support contains a remarkable combination of key nutrients in one supplement, to promote healthy immune function including vitamins, minerals and botanicals.